It’s 1948 and ten-year-old Fred has just watched her teacher leave – another in a long line of teachers who have left the village because the smell of fish was too strong, the way of life too hard. Will another teacher come to the small Athabascan village on the Koyukuk River to teach Fred and her friends in the one-room schoolhouse? Will she stay, or will she hate the smell of fish, too? Fred doesn’t know what to make of Miss Agnes Sutterfield. She sure is a strange one. No other teacher throws away old textbooks and reads Greek myths and Robin Hood. No other teacher plays opera recordings, talks about “hairy os,” and Athabascan kids becoming doctors or scientists. No other teacher said Fred’s deaf older sister should come to school, too. And no other teacher ever, ever told the kids they were each good at something. Maybe it’s because Miss Agnes can’t smell anything, let alone fish, that things seem to be all right? But then Miss Agnes says she’s homesick and will go back to England at the end of the year. Fred what this is about: Just when things seem to be good, things go back to being the same. 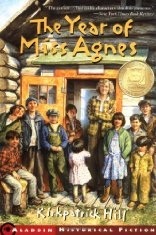 How Fred and her friends grow with Miss Agnes is the heart of this story, told with much humor and warmth by Fred herself. This is a story about Alaska, about the old ways and the new, about pride. And it’s a story about a great teacher who opens a door to the world – where, once you go through, nothing is ever the same again. I’m reading this to my 5 & 6 year old daughters. They are loving it. I wish I had known there were more books by Kirkpatrick Hill when I read Toughboy and Sister as a kid. We live in South Carolina but I would love to visit Alaska some day. Thanks, April! (One of my favourite names, by the way)..I love hearing about kids in the warm part of the country reading about our part..but you’d better hurry up to visit..our Alaska is getting warmer all the time now..give your girls a hug for me and tell them to keep reading everything they can get their hands on.